Hand-crafted Vessels Vases | Art Kraft Wood Products, Inc.
Art Kraft produces only the finest hand-crafted vessels and wood vases made of sustainable exotic woods, each wooden vase is individually designed and turned by a father and son team of skilled craftsmen. Art Kraft has been in the business of making distinctive creations out of domestic and exotic wood for over 24 years, and has designed and produced custom products for, among others, Disney World, Disney Land, Euro Disney, J Paul Getty Foundation, Edmond Allen Shoe Company and Alora Ambience. Many of the hand-crafted vessel designs utilized by Art Kraft in creating segmented wood vases follow the classic styles of the ancient Greeks, Romans and Scandinavians. However, to continue to create new and unique segmented wood vases the craftsmen at Art Kraft are constantly exploring new designs and construction techniques. 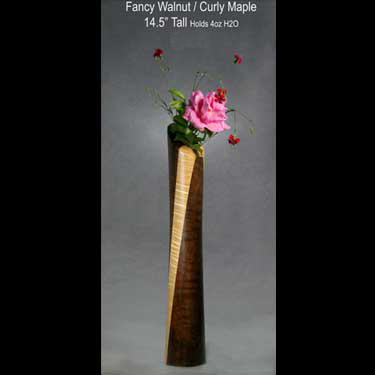 Creating wooden vases from segmented wood turnings allow shapes and sizes that are difficult, if not impossible, with solid wood forms, and the craftsmen at Art Kraft take great pride in fashioning and turning wood segments into beautiful one-of-a-kind wood vases. All wood vases at Art Kraft are finished with an eloquent and meticulously applyed glass-smooth finish. As a final step in the process each of our creations is signed and numbered. Mouse over each thumbnail to view a larger version in the middle. Click on each thumbnail to view more details or purchase an item. Please use the contact page to find out about wholesale pricing. Copyright © 2008. Art Kraft Wood Products, Inc. All rights reserved.